The adage, "Do one thing and do it well" applies in business as it does in all aspects of life. Nyce & Co. takes this seriously. While our organization serves as an umbrella of individual companies specializing in land acquisition, land development, homebuilding, project financing, or Realtor operations, our "one thing" is providing uniquely superior service and unparalleled quality products. In order to be a leader in home building, a thorough knowledge of land development is crucial. The converse is also true. This is where HomeFirst Communities LLC and Tech Homes LLC excel. They specialize in building on finished residential lots with some of the most prominent builders in the region  a virtual list of Whos Who in the national, regional and local fields. Sunchase and Nyce work with realtors and brokers to identify new and exciting development opportunities across the landscape. Southmark Realty LLC is a separate land brokerage operation; its sole purpose is to unite the Realtor community with desirable and ideal development opportunities. Nyce & Co. brings considerable expertise and experience to the often difficult task of "getting a deal done" on the capital side. You can be confident in the knowledge that we secure debt and equity for each situation to ensure completion even when delays occur. Sunchase Capital Partners LLC helps you stay the course. HomeServ services what we build. What a concept! Sunstar Communities designs and builds homes for the active, older adult who wants convenience without the hassle. 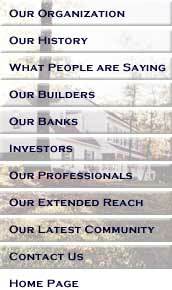 Trumbull Holdings specializes in developing and holding investment property for the long term.